IPL is back, and as expected my blog is back in action… As the year’s pass on, Jobs gets tougher and getting space for personal life/interests gets deteriorated. However it is true to myself, as i have been totally away from blogging, and now thanks to this IPL which still keeps me kicking inside the world of Blogging. As last year I may not blog more about how the events in the match turned out, as there are many sites and live viewers who will have their say/views. 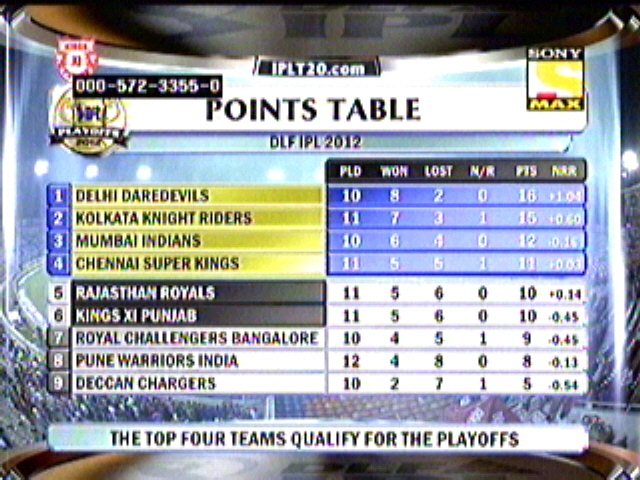 I ll just update the interesting stats, which will give a kick for passionate followers of IPL. First Powerplay – 45/2 in 6 overs. First Catch – Kallis takes David Warner in slips of Sunil Narine. First Runout – Shahbaz Nadeem out with a combined effort from Bisla & Sunil Narine. First Fifty – Mahela Jayawardene of 46 balls. – Unmukt Chand became the 2nd Victim to be dismissed of the very first ball of the tournament opener; previous was Manoj Tiwary in 2010. – Unmukt Chand is also the 15th batsmen to be dismissed of the very first ball of the game. – Umpire Simon Taufel who is standing on 44th game became the highest standing umpire in IPL by passing Billy Doctrove’s 43. – First six in 18.4 overs is the longest wait for the First IPL six, previous was in 2009, where everyone waited till 17.2 overs. – Jayawardene scored his 10th IPL fifty. – Irfan Pathan bowled the first maiden for this season; it is also the 20th time in an IPL match first over is a Maiden. – Irfan Pathan has bowled 8 Maiden in IPL so far and at the second position, Praveen Kumar holds the top place by 9 Maiden to his name. Most no. of Sixes – Gambhir, Jayawardene & Yusuf pathan – 1 Six. Orange Cap – Mahela Jayawardene (66) followed by Gautam Gambhir (42). Hi guys, Its another Double header day… Day 5 in IPL Season 3…. 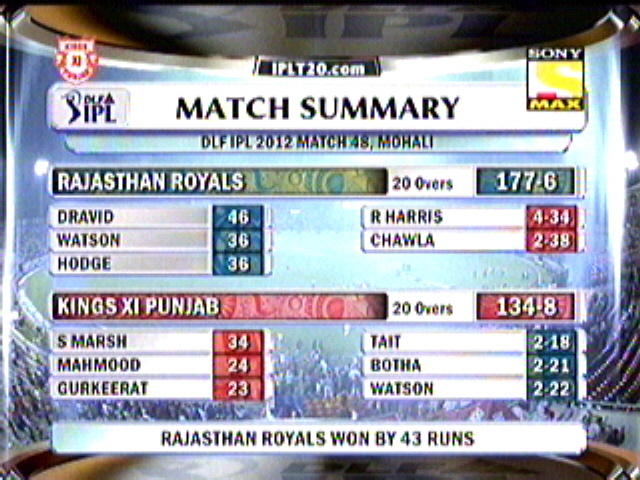 KXIP 203/3 in 20 overs. RCB 204/2 in 18.5 overs. 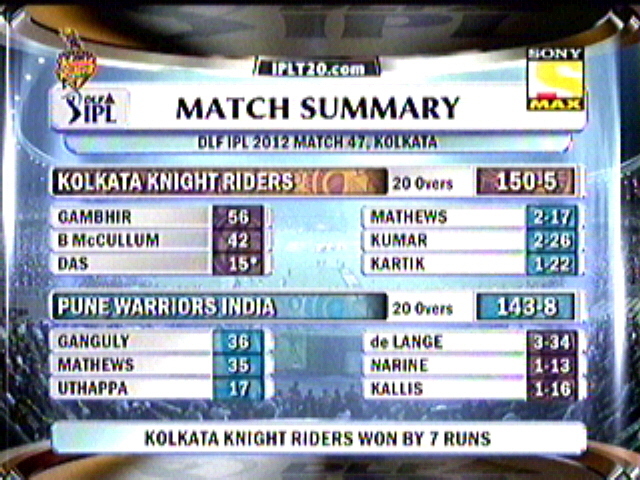 CSK WON MATCH BY 55 RUNS. 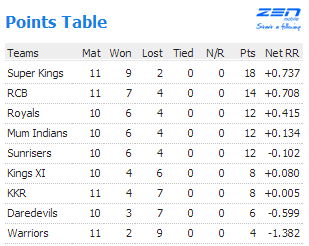 – KXIP is the only team in this season of IPL to survive first 6 overs without losing a wicket. – Manvider Bisla scored his Maiden IPL fifty of 36 balls. – Bopara and Bisla’s partnership of 129 is the best by KXIP. – 129 is also the best first wicket partnership for this season as they go past 101 by Brad hodge and Manoaj Tiwary (KKR). 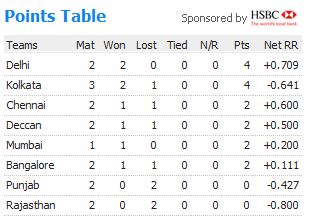 – RCB has lost 6 out of 7 matches in home, other team being DC who lost all their matches in home. – Uthappa scored the second Fastest 50 (19) in IPL, and fastest in this season. – 31/1 is the lowest ever total scored by CSK in the first 6 overs. Orange Cap – J.Kallis (154) followed by Ravi Bopara (133)..